Coming back after the holidays, in a slight haze after days filled with too much romance, wine, friends and cheese, I couldn’t help but notice all the many healthy recipes all around. I mean, all those smoothies and fruit and veggie bowls and scrumptious salads and oh my! Getting back into shape seemed almost as appealing as this New Year’s cake: absolutely delicious, beautiful and very inspiring. And I really need that air of freshness, those beautiful colours. Βut I also need me some butter & chocolate. I’m all for healthy greenness, but also all about balance too. Fruity smoothies, refreshing salads and tasty comforting soups, but also little treats: smalls bites of heaven into which we can indulge to satisfy our sweet tooth and nibble on when the going gets tough and the weather gets chilly. 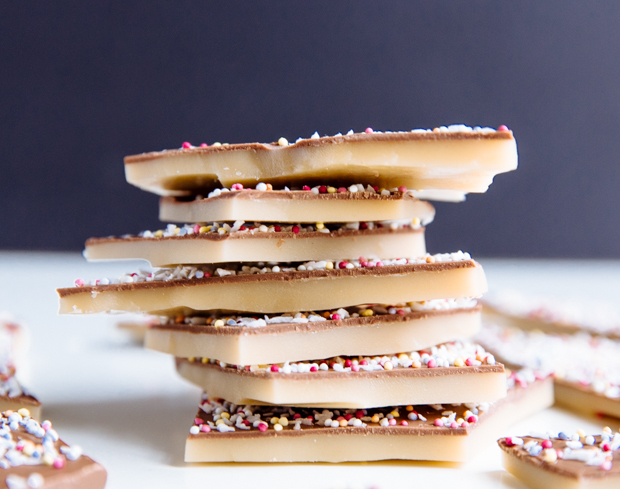 So how about some chocolate, coconut & sprinkle toffee, sweet, homemade, crunchy and delicious, covered in so many colours for extra naughtiness and looks, broken in large or small pieces and enjoyed in moderation, one at a time, slowly and with a big smile on our face? And then sure, bring on the greens again. All about balance- but for now, toffee. Combine the sugar, butter, water and salt in a medium pot over low heat and stir to completely dissolve the sugar. When the mixture starts to bubble, immediately turn up the heat to medium and cook until it start turning amber and smelling nutty- about 15′ (be careful not to overcook, as it will burn and become bitter). Meanwhile, line a baking sheet with parchment paper and set aside. 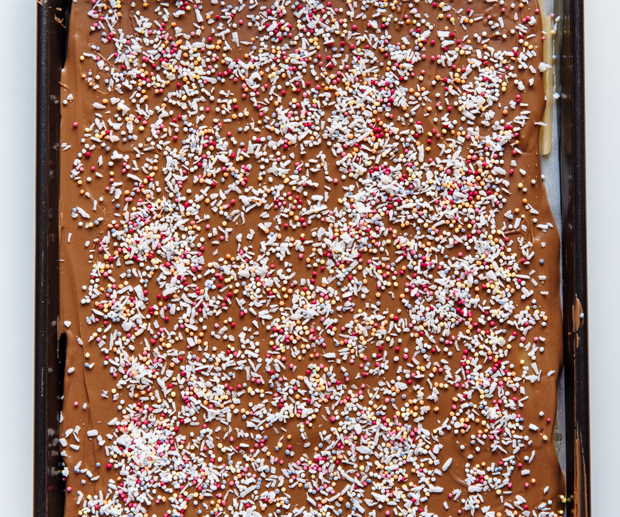 When the toffee is ready, carefully pour into the parchment paper-lined pan and smooth the surface with a spatula. Place in the fridge for several hours or overnight until it becomes very solid. Before you take it out of the fridge, place the chocolate in a microwave-safe bowl and melt in short intervals. Stir well and set aside and combine the coconut and sprinkles. 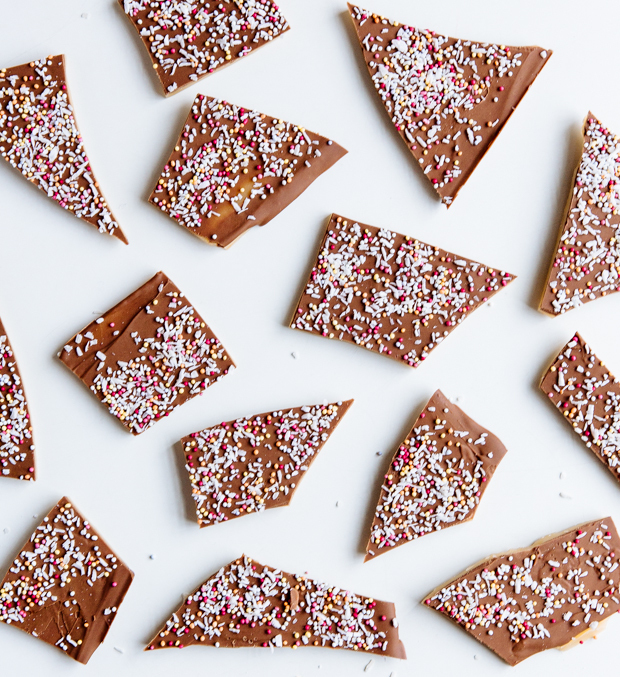 Take the toffee out of the fridge and pour the chocolate over it quickly, smoothing out the surface with a spatula. 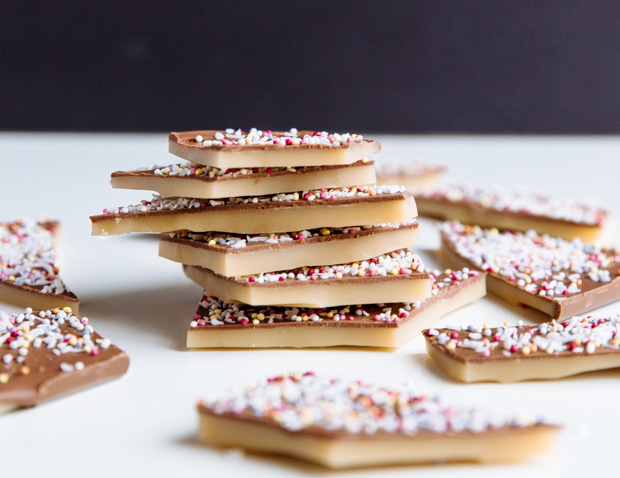 Immediate sprinkle with the coconut & sprinkles and place back in the fridge until it sets completely. Take out of the fridge and break into large (or small) pieces with your hands. Store in the fridge for up to 5 days (but take out about 15′ before consuming). ahhhh…looks super yummy and easy to make. Cant wait my cheating day to try it 🙂 Thx for sharing!